Many members of the game industry, from journalists to developers to executives, have used their little bit of the internets to call E3 a colossal waste of time, an utter failure. They might be right, I don't know. I was too busy trying to play as many games as I could and enjoying the fact that I didn't have to wait an hour to get a latte at Starbuck's. That's not to say I didn't encounter a fair number of disappointments and missteps as I worked my way through the LA Convention Center. They lurked in the shadows of meeting rooms, took up space on the show floor, and sent press conferences crashing down to earth. Some were more dramatic than others, but they all did their part to make me a sad panda. Here's my list of the top five bummers of E3. Again, just like with my favorites from earlier this week, this list is based on my personal experiences and preferences, so don't go yelling at me because I didn't include whatever you think was the worst thing at the show. In fact, if you'd like to include your own worst five in the comments, feel free. 5. Portal -- Microsoft had its fair share of attention-getting guests during its press conference, but the one that drew the most gasps of breathless anticipation was GLaDOS, the homicidal computer from Portal. When she announced that Portal: Still Alive would be coming to Xbox Live Arcade in the Fall, there was much gleeful squirming and smiling. Then we found out the reality of the situation, which is that the levels of Still Alive were taken from the Portal: The Flash Version Map Pack, which is not only still available on PC for free, but is nothing more than a port of the Flash version of Portal that's been online for ages. Worse still, GLaDOS isn't even in it. In a press conference already over-crammed with content, there was simply no need for Microsoft to make such a big deal over recycled content. 4. 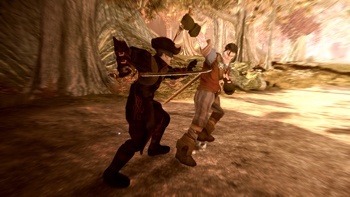 Fable 2 -- Let me preface this by saying that I really, really enjoyed Fable. I didn't care that I couldn't plant a damn acorn, I was fine with the lack of multiplayer, and I didn't miss the ability to have children. I thought it was a great game, and accordingly wanted to love the sequel. I don't, at least not the part of it I've played thus far, which, to be fair, is but one tiny slice. I played through the melee combat, the highlight of which is the more stylishly you fight, the more experience you gain. I simply couldn't get the hang of it, and constantly found myself mashing away on the buttons in a desperate attempt to avoid dying. It's quite possible - probable, even - that playing the game through from the beginning, as opposed to being dropped in the middle, would solve that problem, but the bald truth is that I wanted to be blown away by Fable 2 (pictured), and I wasn't. It's certainly not a bad game, it's just...more Fable.